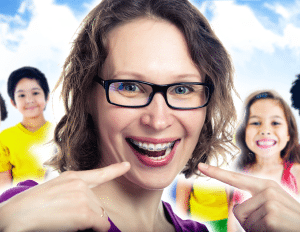 Are you wondering about the braces cost in Rochelle Park NJ? Our team at Milestone Orthodontics specializes in orthodontic treatment including braces and clear braces in Rochelle Park NJ, Paramus NJ, and West Orange NJ. Braces work by applying continuous pressure over a period of time to gradually shift teeth into the desired direction as prescribed by an orthodontist in Rochelle Park such as Dr. Milestone. Metal brackets are bonded to the front of teeth and act like handles, holding the archwires in place. The cost of braces can vary for each patient as it is usually dependent on individual factors such as severity of issues being treated, the length of treatment, and your location. The braces cost in Rochelle Park NJ may be cheaper than in surrounding larger cities or higher income neighborhoods. What’s The Best Age To Get Braces? The American Association of Orthodontists recommends a visit for children by the age of 7. This allows a Rochelle Park orthodontist such as Dr. Milestone to evaluate and assess your child’s needs as well as establish a healthy regiment for proper oral care. However, it is never too late to visit Milestone Orthodontics. We specialize in both adult braces as well as braces for teens and adolescents. Braces can provide results that last a lifetime so there is no reason to wait any longer! At Milestone Orthodontics, our goal is to provide orthodontic care such as braces and clear braces at affordable costs to all of our patients, no matter their budget. We offer numerous payment methods and financing options to ensure that your braces cost always fits into your budget. We accept cash, check, debit, and most major credit card providers. In addition, we also offer financing options through CareCredit, which offers flexible no-interest payment plans to meet your needs. Dr. Milestone and our team of professionals at Milestone Orthodontics are experts in providing affordable orthodontic care. We specialize in braces and clear braces in Rochelle Park NJ, Paramus NJ, West Orange NJ, Union NJ, Verona NJ, Nutley NJ, and surrounding areas of Essex County NJ. Contact Milestone Orthodontics to schedule a free consultation. Call now (973) 325-1777.